In the tunnels, no less. Space is always at a premium on campus. 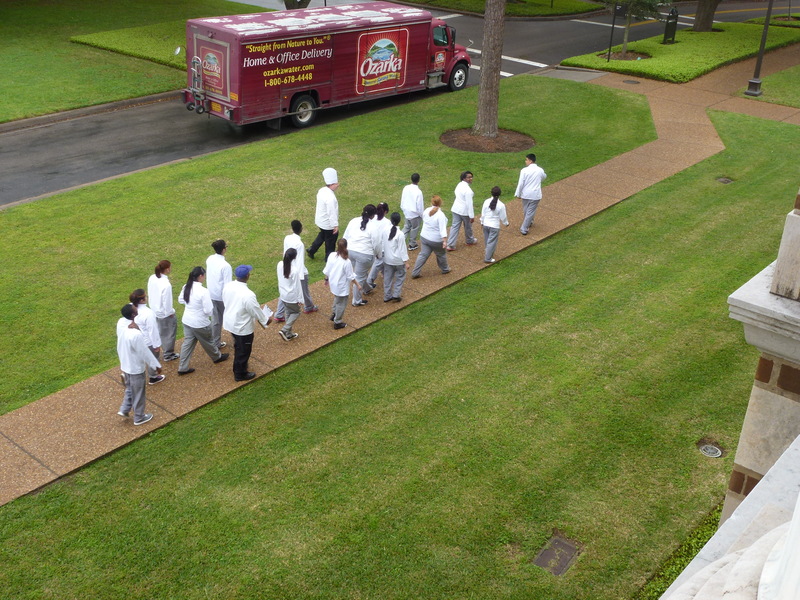 Bonus: I saw a parade of chefs in front of Lovett Hall this morning, quite a striking sight. That’s a Bally “Lost World” introduced in 1977-78. Might help with dating the photo. That is a pretty nice part of the tunnels. Do one of the tunnel rats recognize where it is at ? I would offer the comment that not only does dating the game provide a “no earlier than” dare but the fact that the tunnels were sufficiently open to get all that in suggests that it is probably before they got locked up after Fisk opened them up in their incompetent install. Melissa you might want to look up the photo of the “library splice” to show what I mean. Still about the worst cabling job I have ever even heard about. That spice was indeed the worst example of telephone “craftmanship” I ever saw. I worked for Southwestern Bell as an installer/repairman during my time at rice, a plum of a summer job if there ever was one. I was hanging out with the Bell guys at the old Bell switch in the basement of Allen Center the day of the cutover just to give a hand as needed. One thing I remember is that as we were standing around in that old step-by-step relay PBX room, we heard a line finder go into a fault mode. Since the switch was to be decommissioned in a few hours, we could have ignored it, as it would not have shut the switch down. Instead, we quickly located the fault and repaired it. Rice was still the customer, and deserved the admittedly old technology switch to operate at it best possible service. The Bell system people were always happy to help KTRU with odds and ends of telephone related technology. I will say that the Fisk guys did also help us with a lot of equipment for our special needs as well. Continuing in my off topic post, one of my favorite Rice characters was the night operator on the old cord switchboard. Her name was Ruby, and she was a force to be reckoned. Woe be it to the office that got on her bad side! But she was smart, and always plugged up a direct trunk line to KTRU before she left for the night, so that callers could directly contact the Radio. She did this for a number of other on campus organizations as well. I wish I knew her last name so I could properly thank her for putting up with all of us. Do know the photographer for the Sammy photo? It might have been me, or maybe Tw Cook. I remember this one, and the bag hanging from the pipes on the far right side is the kind of camera bag that a few of us used. Note how the straps are attached to the back of the bag instead of the ends. It looks more like a Wiley Sanders photo, but I don’t think he used that kind of bag. Maybe several of us were down there. This is the main crossing near the power plant. It looks a lot different now, but the steps behind Sammy are the primary clue, and the size of the pipes on the right are the secondary clue. It was one of the largest open spaces in the tunnels, back then, and also had the easiest access, through the power plant, to carry the game in. 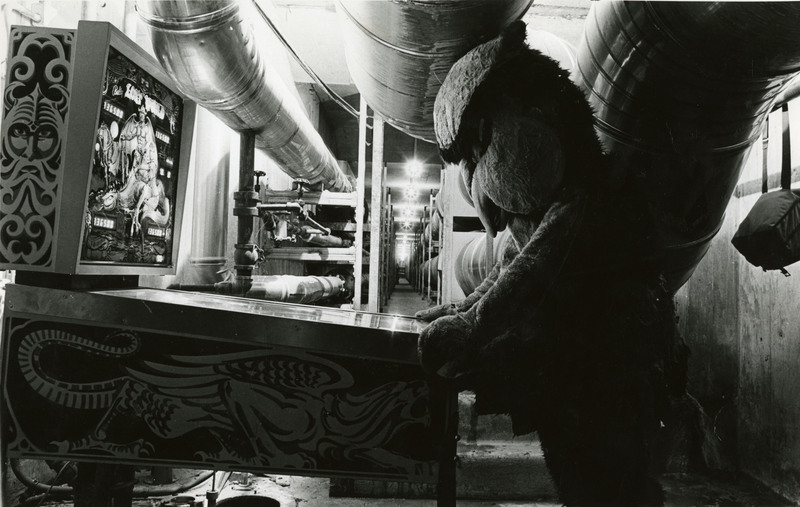 I would venture that this was a promotional picture for the “Steam Tunnels Game Room”, and if you dig through enough Threshers, you’ll find the ad. There’s a letter to the editor on page 2 of the 11 January 1979 Thresher thanking members of the community for help with opening the new game room. I’ll leave finding the ad as an exercise for the community. My brother believes that he was the photographer on this one. I’ve searched through the middle of March in the Thresher archives and haven’t the image. Maybe it was in the ’80 ‘Nile? I don’t think so, because I think I’d remember it. My husband used to spend many hours in the gameroom, and that picture doesn’t look at all familiar. We’ve paged through the yearbooks together enough times that I’d be very surprised if we’d missed it.